The last time we checked in on crude oil spot prices in bubble map form, the map showed how restricted pipeline capacity had led to big Western Canadian Select (WCS) discounts. 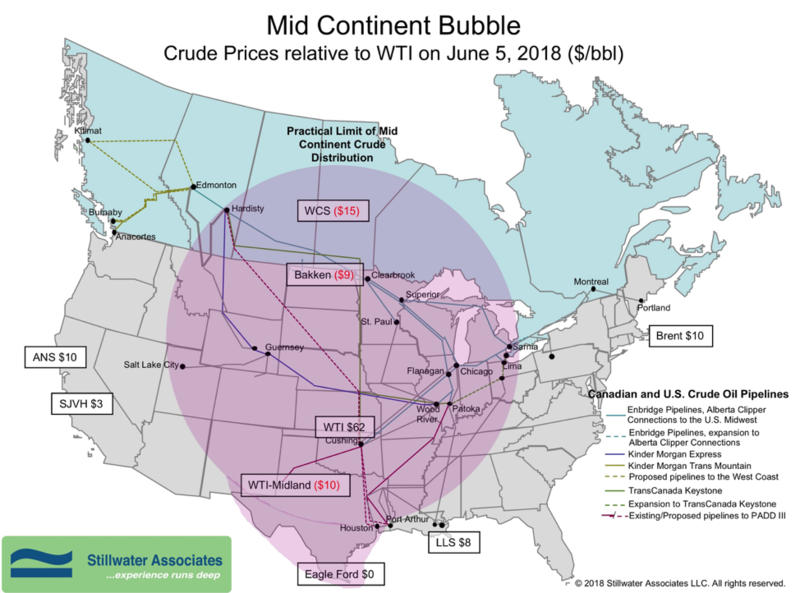 Now, four months later, the bubble map tells the same story of crude oil production outpacing logistics – only this time in West Texas. On June 5th, spot West Texas Intermediate (WTI) was quoted at $66 per barrel, with Brent $10 higher. The WCS discount narrowed to $15 under WTI. On the West Coast, the Alaska North Slope (ANS) differential widened to $10 over WTI while the San Joaquin Valley Heavy (SJVH) differential narrowed to $3 over WTI. On the Gulf Coast, Eagle Ford was priced at parity with WTI, and Louisiana Light Sweet (LLS) jumped to $8 over WTI. The big story, however, is the discount of WTI in Midland to WTI in Cushing. WTI-Midland posted at a $10 discount to supply in Cushing, reflecting the constrained pipeline capacity in West Texas. This discount is a boon to Texas Inland refiners (in the words of one of our Senior Associates “they’re chopping high cotton”). But it is trouble for producers who will have to curtail production until new pipeline capacity can be brought online. Because of the discount, moving product to Houston via rail is economical, but that capacity is also limited. There are several pipeline projects set to come online in 2019 and 2020 that will move crude oil from the Permian to the Gulf Coast. Plains All American’s 585 thousand-barrel-per-day (kbd) Cactus II is already fully committed. The Phillips 66 700 kbd Gray Oak pipeline is scheduled to be completed by 3Q 2019. Epic Midstream’s 675 kbd pipeline is also scheduled to be completed by 3Q 2019. Energy Transfer Partners and Jupiter both have plans for pipelines to be completed by 2020. Those two systems are slated for 600 kbd and 500 kbd respectively. One more point that demonstrates how isolated California is from the Midcontinent Production Bubble. SJVH is heavy – 13 degrees American Petroleum Institute gravity (API)! While WTI is light at 40 degrees API! Because of its density and sulfur content, SJVH is more difficult and costly to refine, while WTI is an easier and less expensive crude to refine. Since there are no pipeline connections from Texas to California, refiners cannot take advantage of the West Texas shale revolution. A portion of the high prices that California consumers pay for fuel is the result of high crude oil prices on the West Coast.